She worked late, with a plan to pick up dinner for herself to eat on the train. I hoped that meant she hadn’t skipped lunch, but she’s a grown-up; sometimes that happens. I wasn’t called for either of the rehearsals I’d been expecting, so I worked a while longer on a church-music project, and then headed for the market. There wasn’t much we needed, but if she wasn’t going to be home for dinner, there would be Brussels Sprouts. Or broccoli, if the sprouts didn’t look good. They looked fine; they came pre-shredded. I would have been happy with whole ones, which I would have halved, steamed lightly, and then sautéed with some olive oil, lemon, salt, and pepper. But the shredded ones would be good, too; I could skip the steaming and make a sort of hot slaw. I heated two pans–one cast-iron, the other non-stick–fed the cats, and put away the rest of the groceries. Our market makes great burgers studded with cheddar and bacon, but they’re too big; I bought a pair and reformed them into three. Two went into the freezer; one went into the now blazing cast-iron pan. My prep also included opening two windows and cranking the exhaust fan to its “jet engine” setting. I was determined to properly cook a burger without setting off the smoke detector. 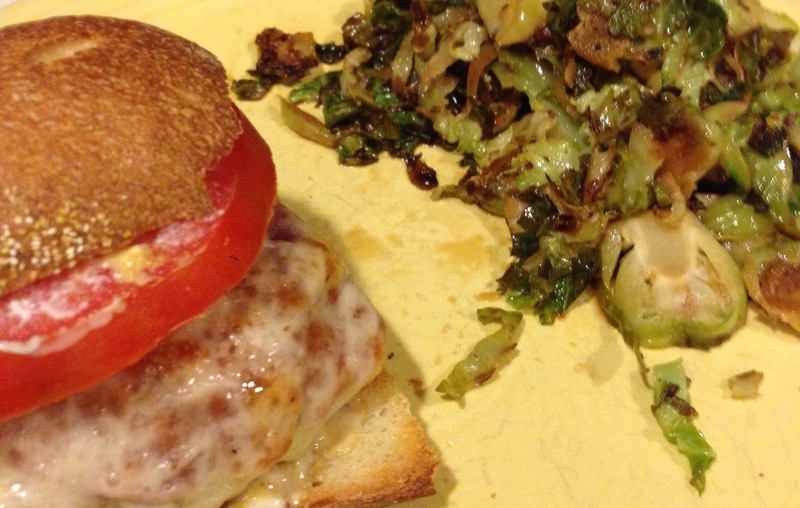 When the burger was seared, I stuck it in the oven and turned my attention to the sprouts. Their skillet had a little oil in it; as they started to brown, I added a few drops each of soy sauce and lemon juice, tossed them a bit. I drizzled on a little maple syrup, a teaspoon of water, turned off the heat and lidded the pan. The market suggested sautéing onions and bacon with the sprouts, but my burger had bacon and I didn’t feel like onion. By the time two slices of crusty bread were toasted, tomato was sliced, and our next-door neighbor had debriefed me of her kitchen-tile purchase, everything was ready–even a lovely cocktail of grapefruit juice, seltzer, a splash of gin, and a few drops of bitters. She would be better company than an old TV show, but when I’m alone I’ve been making my way through the Jennifer Garner series Alias, which I haven’t seen in years. She watched the first couple of episodes with me, but the show didn’t really catch her interest–it’s too suspense-filled for her taste. She tries sprouts now and again, but they’re not her style either. That’s okay; we don’t have to like the same things, and we certainly aren’t going to impose our tastes on each other. The idea of giving her nightmares and indigestion–well, that’s what it gives me. So I’ll wait ’til she works late. Sprouts and spies, a burger and a beverage. It could be worse, but I’m ready for her to come home. This entry was posted in Uncategorized and tagged Burgers, Television, Vegetables. Bookmark the permalink.